Mail | Housing and Residence Life, U.Va. All other mailrooms will be closed from March 10-17. All mailrooms will reopen on Monday, March 18. Bice and IRC mailrooms: Monday to Thursday, 4:00– 7:00 p.m.; Friday and Sunday, 2:00–5:00 p.m.
Shannon mailroom: Monday to Thursday, 10:00 a.m.–7:00 p.m.; Friday, 10:00 a.m.-5:00 p.m.; Sunday, 2:00–5:00 p.m.
Runk, Metcalf, and Lambeth mailrooms: Monday to Thursday, 3:00–7:00 p.m.; Friday and Sunday, 2:00–5:00 p.m.
Housing & Residence Life provides mail services to the majority of on-Grounds undergraduate residents through mailrooms in several locations. Mail information for individual housing areas is available on that area’s webpage. The mailrooms deliver mail to most residential areas and provide a mail and package pick-up point for items sent through UPS, DHL, FedEx, Priority Mail, Express Mail, and other "accountable mail" (certified and insured) services. Please be aware that even if the shipping status on a package is listed as "delivered," packages are not available for pick up until they have been routed to the appropriate mailroom. This may take up to one additional business day. Please wait until you have received email notification from Housing & Residence Life to pick up packages. Please see below for some of the most commonly asked questions about on-Grounds mail. If your question is not answered below, please contact housingmail@virginia.edu. Residents in Brown College should contact University Mail Services with questions regarding mail. Lawn residents and those in Graduate or Faculty & Staff Housing should contact the US Postal Service. What types of mail can be sent to on-Grounds addresses? 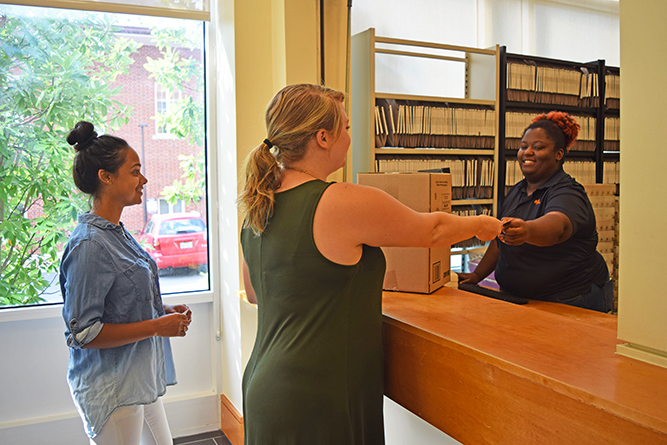 Housing & Residence Life mailrooms accept items sent through the U.S. Postal Service (including Priority Mail, Express Mail, certified and insured mail) and other carriers such as UPS, DHL, and FedEx. We are not able to receive Registered, COD, or Postage Due mail. These items must be picked up at the US Post Office. We ask senders not to send cash to on-Grounds residents by mail. All important mail items and documents should be insured so that a tracking number is available if there is a problem. How can I have flowers, food stuffs, or other perishable items delivered to a student? Simply address the item to the student the same way you would for any other package. You can use the Mailing Address Finder to locate a student's address. How do I address mail to an on-Grounds resident? You can use our Mailing Address Finder to find the correct address both for U.S. postal mail and for packages sent via other carriers. What should I do if the address I used for an undergraduate student is rejected by my shipper? for Lambeth Apartments, using "Lambeth Field"
Many shippers online will have an option that allows you to use the address as you entered it, and you may want to select that. add the words Street, Lane, Road, etc. add any other street name such as Alderman Road, Mccormick Road, Faulkner Drive. Do the Housing & Residence Life mailrooms handle outgoing mail? The mailrooms are not able to collect outgoing mail from residents, but blue US Postal Service collection boxes for outgoing letters are located throughout Grounds. Packages need to be taken to a U.S. Post Office. Locations on or near Grounds include the UVA Bookstore, Barracks Road Shopping Center, the Downtown Mall, and Route 29 North. When will mail and packages be received by the mailrooms? U.S. mail is received daily before noon, Monday through Friday. Special carriers such as UPS and FedEx may arrive at any time during the day. UPS generally arrives between 10:00 a.m. and 1:00 p.m. each weekday. All mail and packages are sorted and posted as soon as possible. You will receive an email notification when we have received a package for you. When can I pick up mail and packages? Regular Mailroom Hours are 3:00-7:00 p.m. on Mondays-Thursdays, and 2:00-5:00 p.m. on Fridays and Sundays. Mailrooms are closed on Saturdays. Mail information for individual housing areas is available on that area’s webpage. Mailroom pick-up windows are open 3:00-7:00 p.m., Monday through Thursday, and 2:00-5:00 p.m. on Friday and Sunday. Mail operations continue as usual during breaks and holidays except for holidays when Housing & Residence Life is officially closed. Notices about modified hours will be posted on this page and the Housing & Residence life homepage. Will my mail be forwarded after I leave on-Grounds housing? First-class mail will be forwarded for six months. First-class mail does not include magazines, newspapers, and packages delivered by carriers other than the U.S. Postal Service. After six months, all mail will be returned to the sender. In order for the correct forwarding to happen, please make sure your mailing address in SIS is up to date.